Lucas Pouille, the 16th seed needed four sets to advance against the tricky Kazakh, Mikhail Kukushkin to book his place in the second week. 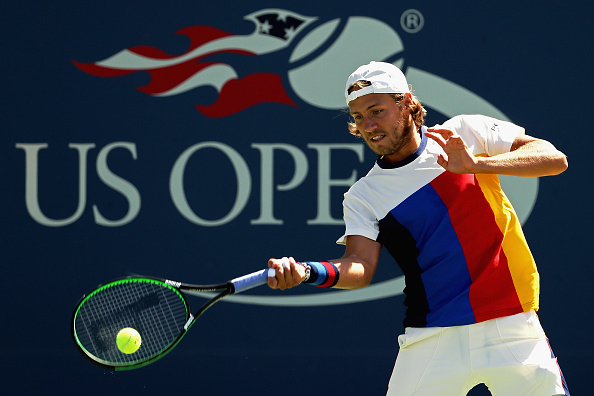 On Court 17, Lucas Pouille took on Kazakh Mikhail Kukushkin for a place in round four. The Frenchman prevailed 2-6, 6-3, 6-4, 6-4 to book his place in week two at the US Open. He will now play Argentine Diego Schwartzman after he shocked former champion Marin Cilic earlier. Both players had an easy, solid hold to get the match underway 1-1. But it was the qualifier who began to fire immediately. Level at 30-all in the third game, Kukushkin hit a pounding forehand and made Pouille run for it but couldn't return the shot as a break point arrived at 30-40. Early on, Pouille's first serve seemed to be causing problems but he managed to save the break point with a good second serve. The 29-year-old would have a second break point saved before gaining a third and forcing the 16th seed to net as he broke. Kukushkin was then forced to save a break point with excellent reflexes at the net before going on to consolidate for a 1-3 lead. Both players held serve momentarily with the Kazakh still up a break, 2-4. The world number 103 continued to trouble Pouille and even got a lucky break with the net cord to bring up two further break points. A backhand unforced error from the Frenchman gave Kukushkin a secure 2-5 lead and the double break as he served for the set. A set point arrived at 15-40 and an ace finished off the opening set, going to the Kazakh 2-6. Kukushkin continued to get the better of the Frenchman early on and in the opening game, earned a break point with a lob winner. Luckily for Pouille, Kukushkin netted a forehand before going on to hold for 1-0. Pouille seemed to have gained confidence from saving a break point and earned two in the next game with a thumping forehand return. The Frenchman sent a return long but it was Kukushkin's turn to send a volley long as he was broken for the first time in the match. The 23-year-old consolidated and turned the tables to now lead 3-0 in the second set. The Kazakh eventually got himself on the board with a hold of serve. But it was Pouille, who was finding it easy, holding his next service game for a 4-1 lead. He then piled more pressure onto Kukushkin, taking a love-40 lead and bringing up triple break points. 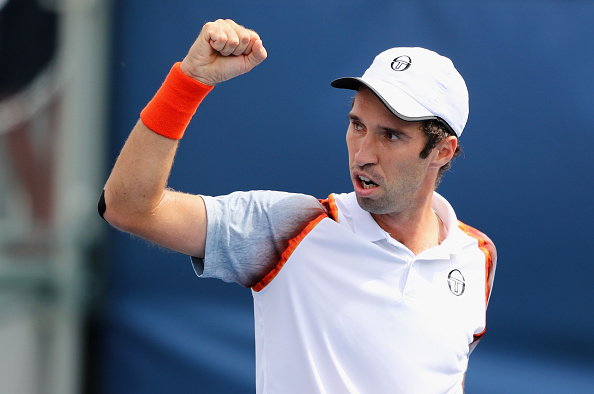 However, Kukushkin impressively took the game to deuce and despite having to save a fourth break point, he finally held to win his second game, 4-2. Both held their next serves which left the Frenchman serving to level the match. Three set points arrived and though one point was saved, Pouille leveled the match at one-set all, 6-3. Having seemingly weathered the early Kukushkin storm, it was Pouille with the momentum heading into the third set. The first three games, however, went on serve with the Kazakh up 1-2. He then took a love-30 lead but Pouille fought back to stay in touch and hold for 2-2. He then grabbed the first break points of the set, two of them with a forehand winner that caught the baseline. Kukushkin both break points he faced but a second forehand winner of the game saw a fourth break point arrive for the Frenchman. Pouille then attacked the Kazakh's drop shot and placed a forehand return in court to break, which he followed up by holding to lead 4-2. The next four service games went to the server as the 16th seed was left serving for a two-sets-to-one lead up 5-4. A comfortable game saw three set points arrived with a terrific, timely first serve. His serve was to be his main weapon as he thumped an ace up love-40 to take control of the match, 6-4. In a crucial set for the world number 103, he began with a comfortable hold of serve. As did Pouille to restore parity very early on in the set. But, the Kazakh couldn't match the Frenchman and even went behind a break point by netting. Angry at lowering his levels, Kukushkin took his anger out and ripped a forehand winner to deny Pouille and hold his serve to get back out ahead, 1-2. Both were fighting hard at this point and were matching each other blow for blow with the next three serves all being held quite comfortably for 3-3. But Pouille, in full flow, ran away with the seventh game, earning three break points and then breaking with the Kazakh once again finding the net as so often in the match. The Frenchman backed this up by fighting from love-30 behind to hold serve and go just one game of the match, 5-3. The 29-year-old held his last serve to put the pressure on the 16th seed. But he dealt with the pressure quite well, setting up two match points as once again, a frustrated Kukushkin netting a forehand. Pouille sent a backhand narrowly wide but on his second match point, clinched the game and the match to progress.